Tech. Sgt. Gabriel, 432nd Wing/432nd Air Expeditionary Wing MQ-9 Reaper sensor operator, inspects his Mitsubishi Lancer Evolution at the Spring Mountain Raceway Nov. 1 in Pahrump, Nev. Gabriel has owned and modified his Evolution for more than five years. CREECH AIR FORCE BASE, Nev. — During the day he sits in a cushy, thick seat in a ground control station flying yet another eight-hour sortie in a remotely piloted aircraft, the MQ-9 Reaper. By night he sits in a thin, lightweight racing seat harnessed into a raw, stripped out track monster. He is Tech. Sgt. Gabriel, 432nd Wing/432nd Air Expeditionary Wing sensor operator and junior executive officer. Gabriel, a soft-spoken Texas native who seems to find his voice with his love of cars, racing, and the raucous roar of his heavily-modified Mitsubishi Lancer Evolution VI. Gabriel enlisted in the Air Force in 2004 as a C-130 Hercules crew chief. In 2011, he made the decision to cross-train to be a sensor operator for the Reaper. Now as a sensor operator, he controls the RPA multi-targeting system ball and camera to conduct intelligence, surveillance, and reconnaissance as well as weapons guidance in support of U.S. and joint operations around the world. The RPA enterprise is at war every day, fighting long hours on changing schedules sometimes missing time with family. The Airmen are charged with bringing a combat mindset to work and then leaving it at the base gates to return home. After a long day of sitting in a quiet GCS, Gabriel has his passion waiting when he pulls in his driveway. No matter what he may have seen that day, it all fades away when he opens the hood of his Evo, cracks open the toolbox, and tackles the next upgrade or repair. His car represents a culmination of five years spent pouring himself into his car and preparing for his love of racing. Each night his garage is home to the sound of the clicking socket tools, metal clinking together as he trades one tool for another, and the occasional dropped bolt hitting the concrete. Tech. Sgt. 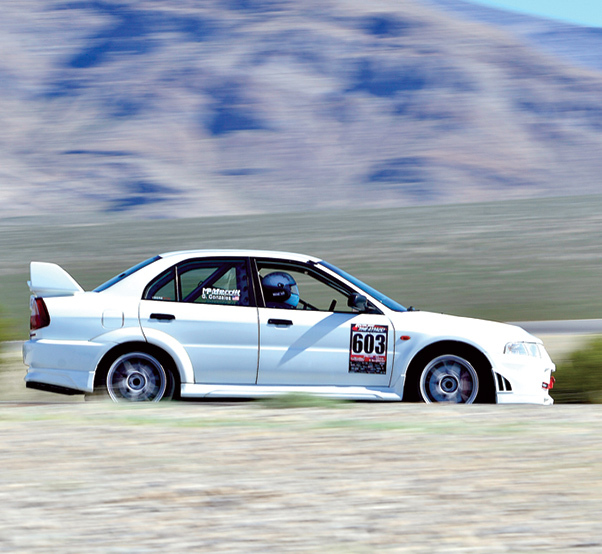 Gabriel, 432nd Wing/432nd Air Expeditionary Wing MQ-9 Reaper sensor operator, races his Mitsubishi Lancer Evolution at the Spring Mountain Raceway Nov. 1 in Pahrump, Nev. Gabriel has owned and modified his Evolution for more than five years. He’s upgraded everything from the engine, suspension, brakes and safety equipment to compete in time attack style racing. Gabriel has set his Evo up for a style of racing called time attack, which involves multiple sessions of different classes of drivers racing against the clock to see who gets the best time. In preparation for his first competition, he attended a track day in California in September to test the new setup on his car. When the day for his first competition arrived over Halloween weekend, Gabriel was ready to attack the track. 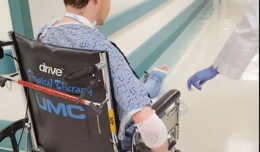 He pushed his car and himself to the limits, again and again, shaving seconds off of his times with every session, the only thing on his mind, going faster than the last time. Slowed only by traffic, Gabriel adapted not to, but with the car, appearing to be at home on the track. He competed in the high intermediate class claiming second place at the end of the weekend. Starting with a lap time in the 2:20’s he whittled his time down to 2:08 around the 2.8 mile course, that time rivaling those in the next and highest class. He exceeded his goal, claiming a podium spot in his first-ever competition, leaving him satisfied, yet eager for his next taste of competition. Until then, Gabriel will continue to fly the MQ-9 in support of global operations while working on his car when he can. By day he sits right-hand drive in a GCS saving lives, by night he sits right-hand drive in a racecar balancing himself to be a stronger leader, Airman, and driver. Tech. Sgt. 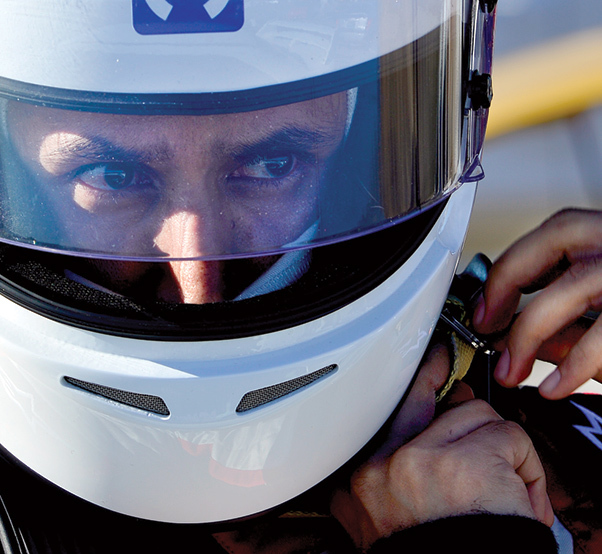 Gabriel, 432nd Wing/432nd Air Expeditionary Wing MQ-9 Reaper sensor operator, puts his helmet on before racing his Mitsubishi Lancer Evolution at the Spring Mountain Raceway in Pahrump, Nev., Nov. 1. Gabriel balances his life between a highly stressful, yet rewarding career, with his passion for cars and racing.